Well, I did ask whose bed it was. On Thursday night I get my answer. Poor Isis. Confessions are called for. On Thursday she has a good long walk in the morning. Excellent: it’s still dull and sunless at five thirty. She has, as usual, played out in the garden all afternoon but we can’t pass up the opportunity for another walk in the park. Isis is a dog who needs as much exercise as she can get. Off we go, quite happily. But when we leave the car Isis is grumpy. In one of her ‘changed my mind, want to go back to the car park’ moods. She sits down. I urge her on. There is no sun. There are no shadows. She’s just being awkward. She attempts to lie down as she does now and again when I’ll not let her go in the direction she wants. I urge her on. Grudgingly, she complies. When we get home I feed her straight away, as usual. Soon after she’s eaten I hear clunk-clunks then lap-laps. I’ve not yet replaced her water bowl in the kitchen and she’s gone upstairs for a drink. I go up, apologise and carry her downstairs. As usual she lies still and compliant in my arms. I switch on the radio. Clunk, clunk again. She’s returned upstairs. After about twenty minutes I climb the stairs quietly to check that she is O.K. She is spark out in my sleeping space. When I enquire at eleven she does not wish to go outside, thank you. She sleeps for twelve hours. 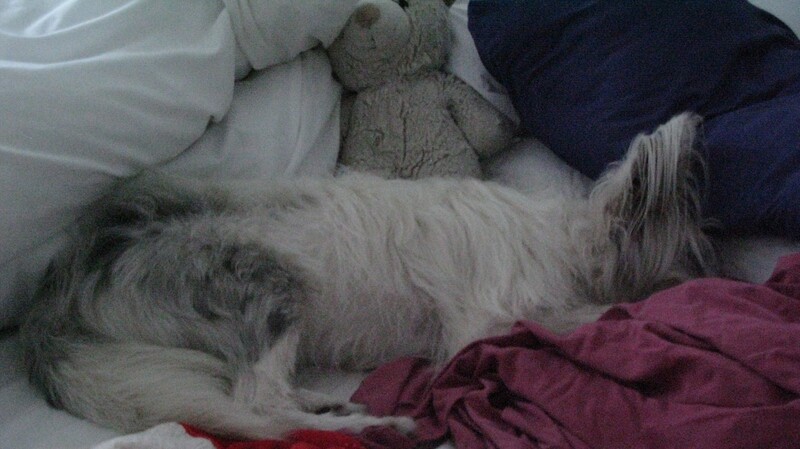 This entry was posted in sleeping arrangements and tagged deaf/blind dog is worn out. Bookmark the permalink.